Saturdays are my Cinderella Moments–the scrubbing the floor and doing the laundry part, not the “meeting your prince” part. Cleaning as always is a job I absolutely abhor. It is a tough job, but someone (like “the mom”) has got to do it. Unlike other households in the Philippines who have “yayas” (babysitters) and household helpers, we had none. I had a working mom, too, by the way. Growing up, I was expected to make my bed, clean the bathroom and do my own laundry. Going on summer vacations at my grandma’s place was no different. Her place was a regular cleaning boot camp! She had a special way of washing dishes, which I had to follow step by step. I had to wash my own clothes, keep my clothes neatly folded, and share in the household chores. My brother and my boy cousin, of course, shirked their duty, but I never did because I was a wuss I was totally scared of granny. I actually mastered the art of cleaning (actually, the art of dusting, because my older cousin is one mean cleaning machine), but I didn’t find it fun. Ever. And so, as I tried to fix a leaking faucet today, I wondered why Disney’s Cinderella and Snow White would go into a sing-and-dance routine every time they do the cleaning thing. Housework must be a lot more horrible back then, without washing machines and vacuum cleaners and even laundry detergents. (We are one lucky generation) But then, they did have those little birds and pigeons and mice to help them. Maybe, those little creatures go into “Disney Princess’ slave mode” once they hear the princess singing. Turn off the water supply (Of course). Get down on your knees and find the valve under your sink and turn it off. Grab your husband’s tool kit and dismantle the faucet to see where the problem is. Make sure you use the right type and size of pliers and adjustable wrench. Try not to scratch the faucet’s soft metal parts by wrapping masking tape around your pliers or wrench. Remove your faucet’s worn-out washer and put a new one. Remove dirt and sediments on the faucet’s stem. And if it still leaks, call hubby! wow. you know how to fix the faucet? you go girl! I hanged out with my boy cousins growing up! I am totally impressed that you know how to fix a leaky faucet. Multi tasking, apir! Bravo for you mommy. Keep it up. My daughter saw this photo of Cinderella, now she wants to see the movie again once she wakes up tomorrow LOL! Hi, nice post. keep it up. Great job there. 😀 I am a Cinderella in our house but I didn't get to fix the faucet. My father does that always. 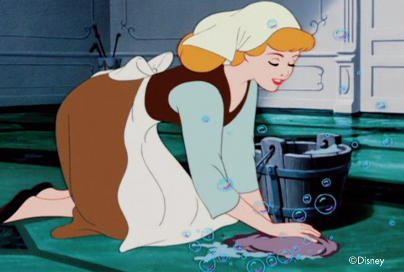 I wish, we, modern cinderellas could have mice and pigeons to help us in our chores too. You know your stuff fixing a faucet there, i have not tried yet.galing mo ha!